Native Instruments B4 II® is one of the best software emulations of the legendary Hammond B3® and reproduces its sound and its rotary speaker cabinet with great accuracy. However it lacks some important features, e.g. the possibility of using your keyboard for turning the "bank rotary switch" or selecting the reverse-color keys ("inverted keys") on each manual. saving and loading different settings (programs). 2) a midi keyboard (better if it has 76 or 88 keys), to play the B4 lower manual or pedalboard. But you can use all the features of the "B4 Controller" with only one midi master keyboard as well; in this case, in order not to permanently sacrifice one octave for selecting the "inverted keys", you can push the "Inverted Keys Switch" when you want to change preset and release it when you want to use such octave for playing. "B4 Controller" doesn't prevent the use of the other N.I. B4 controls assigned to CC messages via the "Controller Assignment" window of N.I. B4 setup. 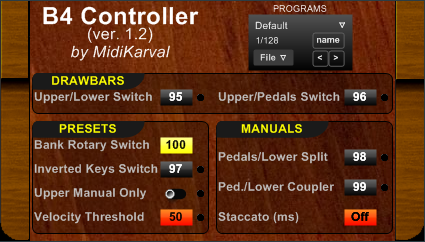 INVERTED KEYS - "UPPER MANUAL ONLY": if you active this function, the “Inverted Keys” function doesn’t work on the lower keyboard, but on the upper only, so that you can use the whole range of your lower keyboard, eventually in the "Pedals/Lower Split" mode. PEDALS "COUPLER" AND "STACCATO": when the "Pedals/Lower Split" function and the “Ped./Lower Coupler” function are active, using the "pedals octaves" of your keyboard you can play in unison the pedals and the lower manual, as many great jazz organists do. Moreover you can choose to make the pedals sound “staccato” (like an upright bass, whilst the "meat of the bass" comes from the lower manual sound). According to Joey DeFrancesco, this is the secret to kicking bass (see Keyboard Magazine, n. 6/1999, page 50). Changing the value in the “Staccato” label you can activate/deactivate the “Staccato” mode and select the relevant length, expressed in milliseconds (from 20 to 400 ms). Now you can activate/deactivate the B4 Controller's functions directly clicking on the black labels with your mouse's left button (whilst clicking on such labels with the right buttons allows to change the value shown on each label).